Oxygen is an abundant element that can form undesired impurities or ceramic phases in metallic materials, while doping the element on metal can render substrates brittle. During interactions with metallic alloys, oxygen takes a state between oxide particles and frequently occurring random interstitials to form ordered oxygen complexes. In a new study, materials scientists Zhinfeng Lei and co-workers observed that unlike in traditional interstitial strengthening, such ordered interstitial complexes could form high-entropy alloys (HEAs) with unprecedented enhancement in strength and ductility in compositionally complex solid solutions. When the scientists doped a model TiZrHfNb HEA with 2.0 atomic percent (2 at%) oxygen, they observed substantially enhanced tensile strength and ductility, breaking a longstanding conflict on strength and ductility trade-off. Engineering strong, tough (damage-tolerant) materials traditionally requires striking a compromise between hardness and ductility. In the new study, oxygen complexes were structurally ordered in nanoscale regions within the HEA characterized by oxygen, zirconium and titanium (O, Zr, Ti)-rich atomic complexes. Formation of these complexes was promoted by chemical short-range ordering among matrix elements within the HEAs. In face-centered cubic HEAs, carbon was reported to improve strength and ductility by lowering stacking fault energy and increasing lattice friction stress. By contrast, ordered interstitial complexes described by Lei et al. mediated a strain-harvesting mechanism with potential for specific use in Ti, Zr, and Hf (Hafnium)-containing alloys. Interstitial elements are usually highly undesirable in such metal alloys due to their embrittlement effects and since tuning the stacking fault energy and exploitation of thermal transfer had not previously led to property enhancement in other alloys. The novel study results therefore provided insight to the role of interstitial solid solutions and the associated mechanisms of strengthening metallic materials. The work is now published in Nature. In the study, the researchers investigated the base alloy TiZrHfNb and its optimally oxygen-doped variant (TiZrHfNb)98O2 (denoted as O-2 HEA here on) for comparison, alongside an interstitial variant with 2.0 atomic percent nitrogen (TiZrHfNb)98N2, hitherto referred as N-2 HEA. Mechanical properties of the three types of HEAs were observed using tensile stress-strain curves. A strong strengthening effect was observed for both oxygen- and nitrogen-doped HEAs. As expected from conventional interstitial strengthening, the ductility of the N-2 HEA reduced. Addition of 0.2 at% (atomic percent) oxygen to the base HEA (TiZrHfNb) improved its strength and ductility. A substantial work-hardening effect was observed for O-2 HEA compared to base-HEA and N-2 HEA, to impart an unexpected increase in ductility to the oxygen doped material. The addition of more than 3.0 at% oxygen, however, led to deterioration of the observed mechanical properties. 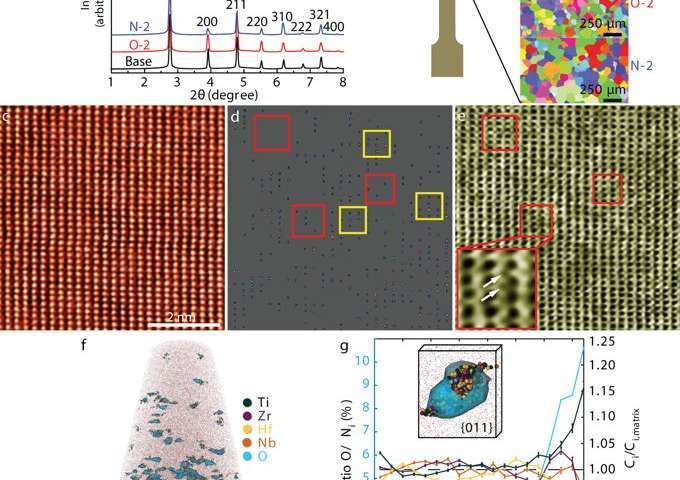 To understand the underlying mechanism of this anomalous, interstitial solid-solution strengthening effect observed with oxygen doped materials, nanostructures of materials were investigated at the atomic scale. For this, the scientists first used synchrotron high-energy X-ray diffraction (XRD) patterns of the base HEA compared with the two alloy variants of O-2 and N-2 HEA. The results showed that addition of either nitrogen or oxygen to the base HEA did not change its single-phase body-centered cubic (b.c.c) structure. This observation was confirmed by electron back-scattering diffraction mapping. In the scanning transmission electron microscope high-angle annular dark field micrograph (STEM-HAADF) images of the O-2 HEA; light atoms were represented in dark contrast, while heavy atoms were imaged bright. The observations revealed regions of light atoms (Ti, Zr-rich) and regions rich in heavy atoms (Nb, Hf-rich) in the O-2 HEA. Similar zones also appeared in STEM images of the base and N-2 HEAs to confirm chemical short-range ordering among the metallic matrix elements as an inherent feature of HEAs. During deformation in any one of the three alloys, no phase transformation occurred. Ex-situ transmission electron microscopy (TEM) and in-situ mechanical testing confirmed that deformation of the three alloys occurred similarly via the process of dislocation glide. Statistical analysis of STEM-HAADF and corresponding annular bright field (ABF) images conducted thereafter demonstrated that oxygen preferred interstitial positions adjacent to light-atom-rich lattice sites. Such preference was not observed in the N-2 HEA. In accordance with the solid-solution strengthening model proposed by Fleischer, the calculations for O-2 and N-2 HEAs confirmed their hardening mechanisms were of interstitial nature. Yet, unlike traditional interstitial strengthening that embrittled alloys, the presence of oxygen simultaneously increased both strength and ductility in the b.c.c TiZrHfNb HEA. The key question posed by the substructure analysis is why the addition of interstitial oxygen greatly enhanced the alloy's work hardening capacity and ductility, compared to nitrogen-containing complexes. During plastic deformation, dislocations are typically stored and arranged in ordered patterns in metal alloys. To study such dislocation patterns in more detail, the researchers conducted high-resolution aberration-corrected STEM characterization of pre-strained specimens. At the nanoscale, oxygen-containing complexes severely distorted the local lattice, causing a large strain field around them. During deformation, the ordered oxygen complexes (OOCs) interacted with dislocations as revealed by STEM images. To further illuminate the intrinsic mechanisms at the atomic scale, the scientists conducted aberration-corrected STEM. 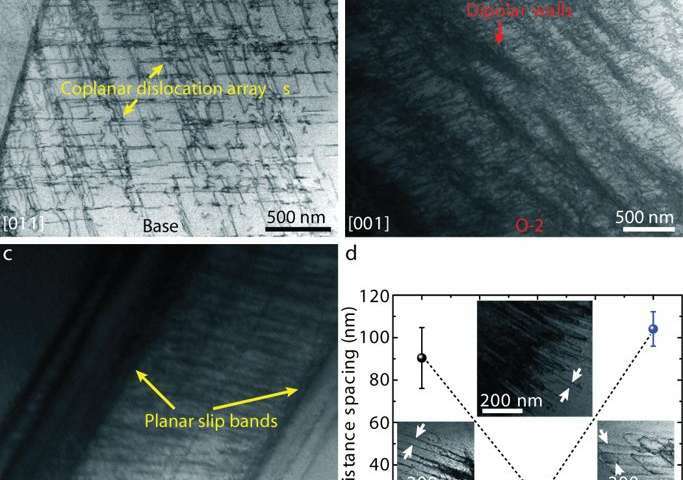 At this point, they observed that the intrinsic features of OOCs in the O-2 HEA alloy variant enabled high work hardening due to dipolar walls that emerged with increasing stress that eventually led to higher ductility in the oxygen doped materials. Such complex-dislocation dynamics were not observed for the N-2 HEA, leading to comparatively modest ductility as a result. The findings by Lei et al. showed that the strength-ductility conflict could be overcome for a class of metal alloys (HEAs), while demonstrating a completely new type of strain-hardening mechanism based on ordered interstitial complexes. The resulting high strain-hardening reserve led to increased strength and ductility. By itself, the base HEA (TiZrHfNb) is not suited for use in high-temperature applications due to oxidation problems. Alloying with antioxidant elements such as Al, Si and Cr could improve resistance to oxidation with HEAs – as also previously seen in HEA designs. The authors recommend application of such ordered interstitial strengthening mechanisms to a wider range of other alloy material classes for improved strength-ductility and strain-hardening during the development of advanced materials.